This panel session highlighted that MPTs would provide a greater selection for women to choose from based on their varying sexual and reproductive health (SRH) needs, and thus would empower women to control their own health. However, there are several challenges that researchers, providers, and policymakers need to address to better protect women’s SRH. It also provided an overview of the microbicide landscape and a discussion for aligning research and development investments. It also emphasized the benefits of MPTs for women worldwide and the importance of taking their perspectives into consideration. Chandhiok, N. What are MPTs and why do we need them? What's available now and on the horizon. Rosenberg, Z. Microbicides, where are we today? 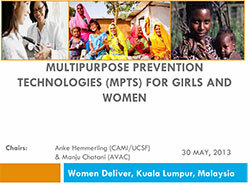 Caswell, G. What do these technologies mean for women living with HIV?